. . . because some kids can’t wait for Christmas! Follow us on social media to stay up to date with the latest Christmas Dreams news and upcoming events! Here at Christmas Dreams in Winter Springs! We are excited to announce that Santa Tim Connaghan will be hosting his School 4 Santas with us! Santas need to start early in the year if they want to make the best of the training they are receiving. So getting your training done by summers-end allows you the time necessary to apply what you have learned. For an additional $149 per person or $199 per couple, on Monday, I will be offering the advanced day of training, “Making the Moment,” with concentration and practical application on photography, posing, special events, and expanded elements for professional Santas and Mrs. Claus. Included is a copy of my newest book, “The Special Santa!,” which contains tips, advice, techniques and over 100 photos with examples for the Professional Santa and Mrs. Claus. Special certificates acknowledging advanced study, will be presented. You may register to attend only the “Making the Moment,” training. However there is a requirement that you previously attended one of our two-day general schools. To provide Christmas experiences 365 days a year for children and their families who are battling life threatening illnesses. Below are the different experiences we offer as we help families create memories and discover the hope and joy of Christmas 365 days a year. Making Santa’s favorite cookie with Mrs. Claus. This is the mobile expression of Christmas Dreams. It is a 40 foot trailer that has been converted into Santa’s “mobile home.” We can provide this experience anywhere a 40 foot trailer can fit—hospitals, homes, parking lots, etc. Inside children discover Mrs. Claus’ kitchen, a Tinker Shop and Santa’s man cave. Santa’s Man Cave—children get to spend a special one on one visit with the Big Man himself. They can try on Santa’s boots and coat, share their lists, read stories and more. Outside the experience, children can play reindeer games with Christmas Dreams evles, drive a sled, and have a snowball fight inside a giant snow globe. Santa makes a special trip to the NICU to check on babies who will not be home for Christmas. Santa also has a special moment with siblings and caregivers. This visit brings a bit of Christmas cheer and hope to families who desperately need it. A sparkly Christmas pillowcase for a special friend! 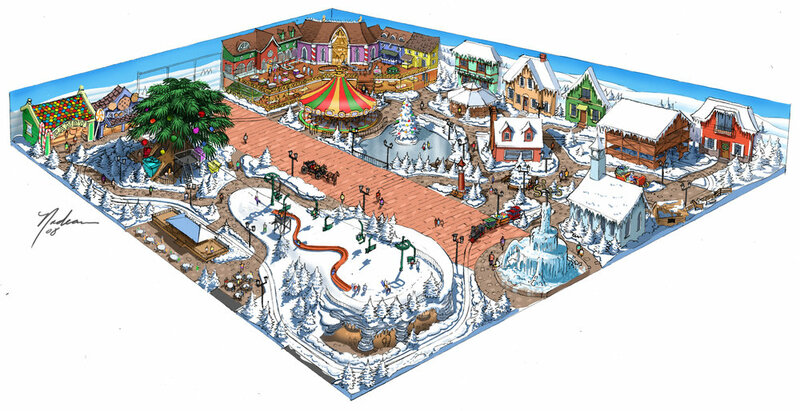 Our BIG Dream is to build an indoor, North Pole themed resort where families can spend several days with Santa, Mrs. Claus and the Christmas Dreams elves…and once again, 365 days a year! Inside families can visit Santa’s Workshop, Mrs. Claus’ Kitchen, a Christmas Tree House, go ice skating, sled down a snow covered mountain, visit the reindeer barn, ride the Jingle Bell Express and so much more. What if you could forget you were sick and just enjoy being a kid? What if you could experience a bit of Christmas hope, joy and magic in the midst of the struggle even if just for a moment? That is our goal as we make the Christmas Dreams of children come true. We help families create memories to last a lifetime, we bring cheer and instill hope to those who so desperately need it. Every day 32 children are diagnosed with cancer in the US. One out of every 5 will not survive. We celebrate Christmas every single day of the year because some kids just can’t wait for Christmas! Our goal is to bring the magic, joy and hope of Christmas to children and their families whenever they might need it. One child, one family, one moment impacted for a lifetime. You could be the one person to help make a Christmas Dream come true! There are many ways you can be an elf and help Christmas Dreams come true. Attend Elf University (offered once a year) to become an official “Christmas Dreams Elf.” This allows you to be part of the team that brings Christmas is Coming to life. Consider financially supporting the mission of Christmas Dreams. Your donation can help make Christmas Dreams a reality.